Foxconn's AHD1S-K is another small-form-factor board looking to leverage the low-power and price advantages of AMD's Fusion chip. So what can it make of the underwhelming E-350? Well, at around £100, it's one of the more competitively priced boards to offer the AMD processor. Remember that the E-350 is a Fusion chip and therefore packs not only a pair of processor cores, but an integrated graphics core, a memory controller and more. That means you need only add memory and storage to create a functional PC, putting the total bill within striking distance of £150. Of course, you'll also need a case with a power supply, but shop carefully and an all-in price of £200 might just be doable. The flip side to this compelling value proposition is a frills-free feature-set. The CPU doesn't have a cooling fan, for instance, and you only get two SATA ports. We've already mentioned that the inability of AMD's E-350 to beat Intel's Atom with a big stick has been one of the biggest disappointments of 2011 so far. 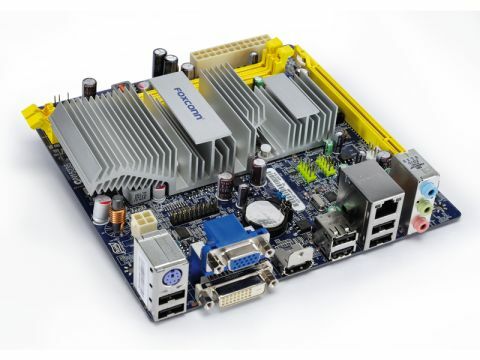 But we, and this Foxconn Mini-ITX motherboard, must soldier on with the performance available. For proper computing tasks, such as professional rendering, that's a real drag. Despite a pair of 1.6GHz cores, this board is up to 13 times slower than the fastest desktop PCs. Even investing in an entry-level Intel CPU, such as a Core i3, means you'll be able to thrash it silly. The fact the AMD Radeon HD 6310 graphics core is a solid performer is also redundant, given that the E-350's CPU cores are left lagging behind. Instead, it's the AMD UVD3 2D video engine that saves the day. It not only ensures this board has the goods to decode all kinds of locally stored HD video files, but also allows for hardware acceleration of CPU-wilting Flash video streams. As for the passive-only CPU cooling, there are pros and cons. On the upside, even the quietest fan isn't as silent as no fan at all. That could be crucial for a home cinema installation. On the other hand, AMD's little Fusion processor gets properly hot under heavy load. Whether that spells reliability issues down the road is hard to judge. However, unless you're striving for silent operation, we'd always err on the side of caution and have some active cooling. Given that context, however, the fact that the AHD1S-K lacks any overclocking options in the BIOS probably doesn't make a difference. It runs hot enough at standard operating frequencies anyway, let alone overclocked. No, AMD's E-350 Fusion chip is no screamer, so it's best to keep it simple with a relatively cheap, basic board like this Foxconn offering. The Mini-ITX form factor, passive cooling and excellent 2D video feature set all add up to a compelling home cinema package. While we always expect to make concessions in return for compact proportions, though, a mere pair of SATA ports is stingy by almost anyone's standards. In order to achieve home cinema perfection, we'd also like to see the 3.1 sound output upgraded and the addition of an optical S/PDIF port.